Exhibition on Jews in the Danish Theater takes a Page from Tudvad’s Book! 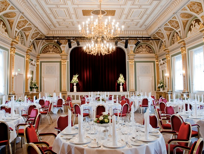 There is a new exhibition entitled “Teater og kultur” (theater and culture) in the museum that is part of Hofteatret (the court theater) at Christiansborg Palace on Slotsholmen in Copenhagen. It concerns the relation between theater and the social-political life in mid-nineteenth-century Denmark. This was an extremely tumultuous period in Danish history. It was the beginning of genuine democracy in Denmark as well as the period of the Three Year’s War in Schleswig, a war as divisive for much of Danish society as was the Civil War for American society. There are three parts to the exhibition. The first is entitled “Breve fra et grænseland” (letters from a borderland) and concerns the effect of the Three Year’s War on Fridolin Banner, a soldier on the Schleswig front, and his father, Johan Daniel Bauer an actor in the Danish Royal Theater who endured not merely constant rumors relating to the conflict in which his son was involved, but also a raging cholera epidemic in Denmark’s capital. The second part of the exhibition is entitled “Kærlighed og magt I korridoreren” (love in the corridors of power) and concerns Frederik the Seventh and his lover, Louise Rasmussen, also known as Grevinde Danner (Countess Danner), to whom he was “married” as the Danes say “til venstre hand” (to the left hand). Click here for the AOK-Guide. The article didn’t say for how long the exhibition will be up. My suspicion is that it will be up all summer, so if you are planning a trip to Copenhagen this summer, you should definitely check it out. I will have more on Tudvad’s book soon!